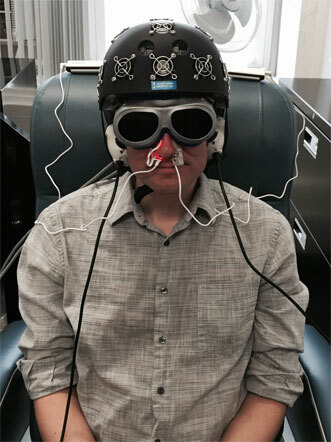 Following promising findings obtained from a pilot program, researchers at the VA Boston Healthcare System are testing the effects of light therapy on brain function in veterans suffering from Gulf War Illness, also known as Gulf War Syndrome. The U.S. Department of Veterans Affairs defines this condition as a cluster of medically unexplained, chronic symptoms that can include fatigue, headaches, joint pain, indigestion, insomnia, dizziness, respiratory disorders and memory problems. The therapy, although still considered “investigational” and not covered by most health insurance plans, is already used by some alternative medicine practitioners to treat wounds and pain. Participants in the study will wear an LED helmet, intranasal diodes and LED cluster heads placed on the ears. Goggles are worn to block out the red light. Courtesy of the Naeser Lab/Boston University School of Medicine. Veterans in the study will wear a helmet lined with LEDs that apply red and near-infrared light to the scalp, as well as diodes placed in the nostrils, which deliver light deeper into the brain. The light is painless and generates no heat; a treatment takes about 30 minutes. One trial already underway aims to enroll 160 Gulf War veterans. Half the veterans will receive the real LED therapy for 15 sessions, while the others will get a placebo version using sham lights. Then the groups will switch. In the end, all the volunteers will end up receiving the real therapy, although they won't know at which point they received it. After each veteran’s last real or placebo treatment, he or she will undergo brain-function tests. “We are applying a technology that’s been around for a while … but it's always been used on the body, for wound healing and to treat muscle aches and pains, and joint problems,” said lead investigator Margaret Naeser, Boston VA research linguist and speech pathologist and a research professor of neurology at Boston University School of Medicine. “We're starting to use it on the brain." Naeser has conducted past research on laser acupuncture to treat paralysis in stroke and pain from carpal tunnel syndrome. MRI scans indicate that LED therapy increases blood flow in the brain. It also appears to have an effect on damaged brain cells — specifically on mitochondria — which output energy in the form of the chemical ATP. The red and near-infrared light penetrate through the skull and into brain cells, subsequently spurring mitochondria to produce more ATP. According to Naeser, that can mean clearer and sharper thinking. Naeser said brain damage caused by explosions, or exposure to pesticides or other neurotoxins — such as in the Gulf War — could impair mitochondria. She said light therapy can be a valuable adjunct to standard cognitive rehabilitation, which typically involves "exercising" the brain in various ways to take advantage of brain plasticity and forge new neural networks. LED treatment can supplement what current cognitive behavioral therapy offers for people with traumatic brain injury (TBI) and post-traumatic stress disorder (PTSD), with a combination of both treatment approaches most likely to yield the best results, Naeser said. Naeser said that because the 160-verteran trial “is a blinded, controlled study, neither the participant nor the assistant applying the LED helmet and the intranasal diodes is aware whether the LEDs are real or sham. So they both wear goggles that block out the red LED light." 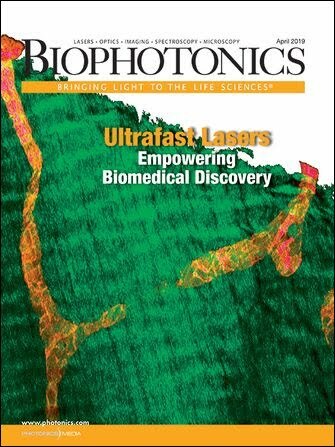 Besides the Gulf War study, other trials of the LED therapy are getting underway. Later this year, a trial will launch for veterans ranging in age from 18 to 55 who have both TBI and PTSD. This VA-funded study will be led by Naeser’s colleague, Dr. Jeffrey Knight, a psychologist with the VA’s National Center for PTSD and an assistant professor of psychiatry at Boston University School of Medicine. For more information, visit www.va.gov.